All of our powerheads are inspected and bored to alleviate all cylinder distortion and scoring caused by previous wear. 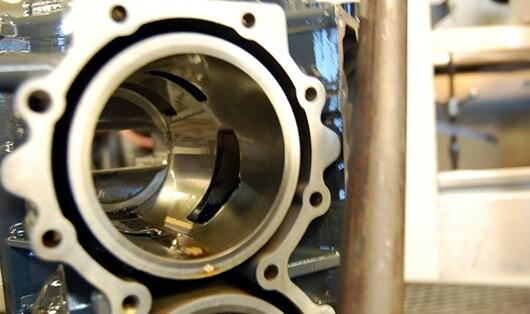 At the end of the bore process, the cylinder walls will be perfectly smooth and round. In some cases, it is necessary to bore cylinders beyond the stock size. A majority of our powerheads are bored to .015" over, but none are ever bored beyond .030” over (Most other remanufacturers go up to .040 over). After the cylinders are bored, they are honed. The honing process is an abrasive machining process that produces a cross-hatch pattern into the cylinder walls. 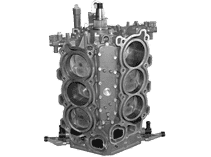 While it seems counter-intuitive to scratch a pattern into a smooth cylinder wall, the cross-hatch pattern allows oil to travel through the channels and provide proper lubrication between the piston rings and cylinder wall. The cylinder heads (or cylinder covers) can warp slightly over time. The milling process shaves off a thin layer of metal with each pass. 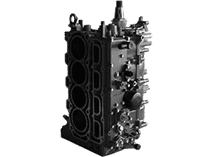 After enough passes, the cylinder head surface will be perfectly flat which ensures the cylinder head gasket seals completely. Connecting rods are machined and gauged to within a half-thousandth for improved operation. Rods are carefully machined to avoid taper and to the standard diameter of OEM specifications. Any rods that don’t exceed OEM spec are replaced with new. All powerheads include new OEM or Crowley Marine brand gaskets and seals, everytime. 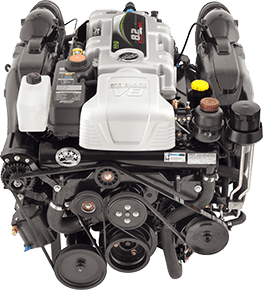 Crowley Marine brand new and remanufactured powerheads also include an installation gasket set at no additional charge. Your engine may have lost some of its power over the years, or may have a larger issue and be completely out of commission. A replacement powerhead can help you avoid the expense and uncertainty of a complete rebuild. Back to the original specs, the original performance, the original thrills. Guaranteed. 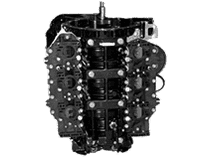 Crowley Marine brand powerheads are built to strict OEM specifications, include brand new parts every time and perform like new. In addition, many units include various engineering upgrades to improve the life and performance of your engine. With over 10,000 satisfied customers our powerheads have been proven in various applications from recreation to commercial and everything in between. All units include a 12 month warranty. We also stock new OEM Mercury, BRP (Johnson/Evinrude) and Yamaha powerheads directly from the manufacturer. Ready to order? Feel free to compare us to the competition. Have a question? contact us anytime. Whatever your powerhead needs may be, we have the exact part in stock and ready for delivery. 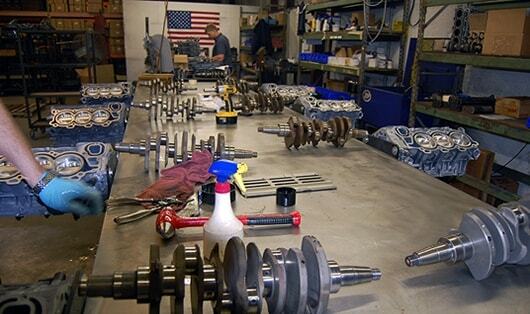 Typically, our engine builders will assemble the powerheads in batches of a single model. Building multiple identical powerheads at the same time ensures accuracy and consistency across the board. It also allows us to keep plenty of inventory for each model. Utilizing 3 large warehouses allows us to keep plenty of powerheads on hand and ready to ship. Because of our large inventory, most powerheads will ship out the very same day you place the order. 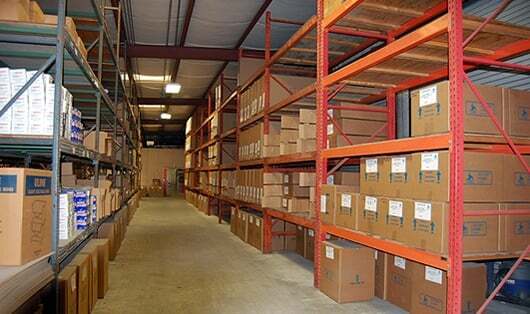 We also keep a very extensive inventory of powerhead cores. This allows us to quickly build more powerheads when particular models run low on inventory. All of our powerheads are packaged on a wood base and then surrounded in expandable foam. 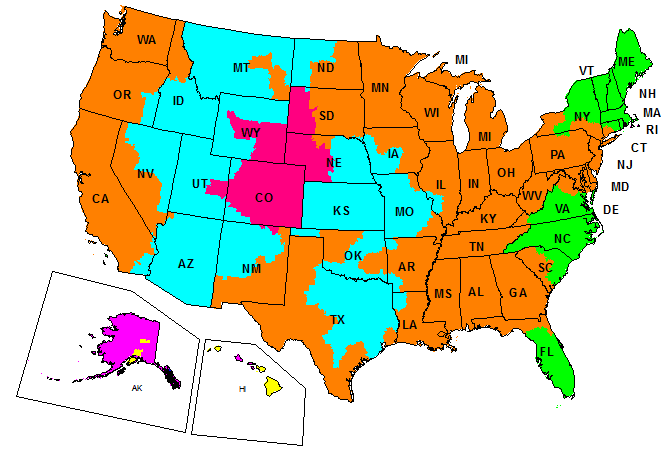 All of the 2, 3, and 4 cylinder powerheads ship using standard UPS or FedEx ground service. 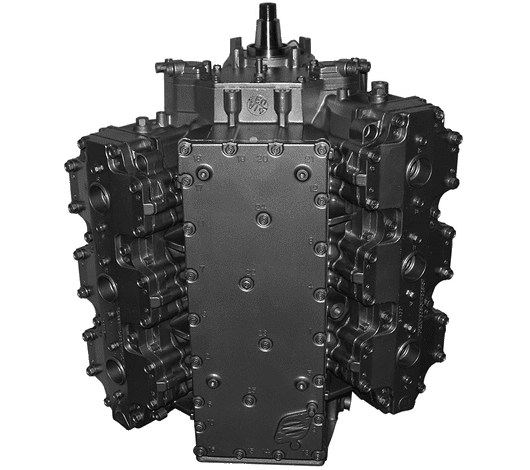 Some of the larger V6 powerheads must ship using a freight carrier. Expedited and international shipping options are also available. All powerheads, whether Crowley Marine brand or OEM include a full 12 month warranty. The majority of our customers never have any issues with their powerhead or installation, however in the rare case something does arise you can rest assured that you will be covered.